They say matches are made in heaven. But for Ignacious Tirkey and Masira Surin, it was made at the national camp for hockey. It was love at first sight, both have confessed. The couple, one an army officer and the other a railway employee, have played for respective Indian teams. Tirkey, better known as Captain Tirkey among colleagues, joined the army when he was in his late teens and with his talent with the hockey stick, he rose up to become a physical training officer, now posted in Shillong. Sitting in his humble office at the sprawling 58 Gorkha Training Centre in Happy Valley, Tirkey talks about his journey to the national hockey team and his love. The 5.7-foot man in blue tracksuit talks nonchalantly about his feat, which only a few can achieve. Tirkey hails from Lulkidihi Nawapara, an obscure tribal hamlet in Odisha’s Sundargarh district that has produced the best hockey players in the country in the last few decades. A Google search will open up several pages of Tirkey’s achievements and yet the simplicity of the national player is something that strikes one the most. A wide desk, an arm-chair and a wooden sofa set in the office room complement the man’s modesty. Though Tirkey’s village is part of the eastern state’s backward region, many young boys from the hamlet have successfully broken out of the vicious circle of poverty and neglect, says Tirkey, who picked up the hockey stick when he was in Class VI. His talent was noticed and he was given a chance to stay at Pamposh Sports Hostel in Rourkela run by the government. He played at the district level during his stay in the hostel from 1993-98. In 1998, Tirkey joined the army and was sent to Bangalore. He was only 17.5 years old. “I became a part of the MEG (Madras Engineering Group, Indian Army) Hockey team and played my first national tournament (in 2000 in Jammu) with the services team. I improved a lot with regular practice and best training,” he says. Tirkey’s joining the army was a turning point in his career in hockey, the 38-year-old PTO believes. In 2001, he was chosen for the national team. He played the first international tournament in the same year in Egypt. The Indian team beat Argentina 6-1 in the Junior World Cup in Australia in 2001. But the hockey champion says he cherishes the team’s win in the Asian Championship in 2003 as “the winning goal was scored by me”. “The final was against Pakistan and the score was 2-2. Only two minutes were left. It was a tense situation and I scored for India,” Tirkey’s face brightens as he recollects. In the same year, India again beat Pakistan in Hyderabad. 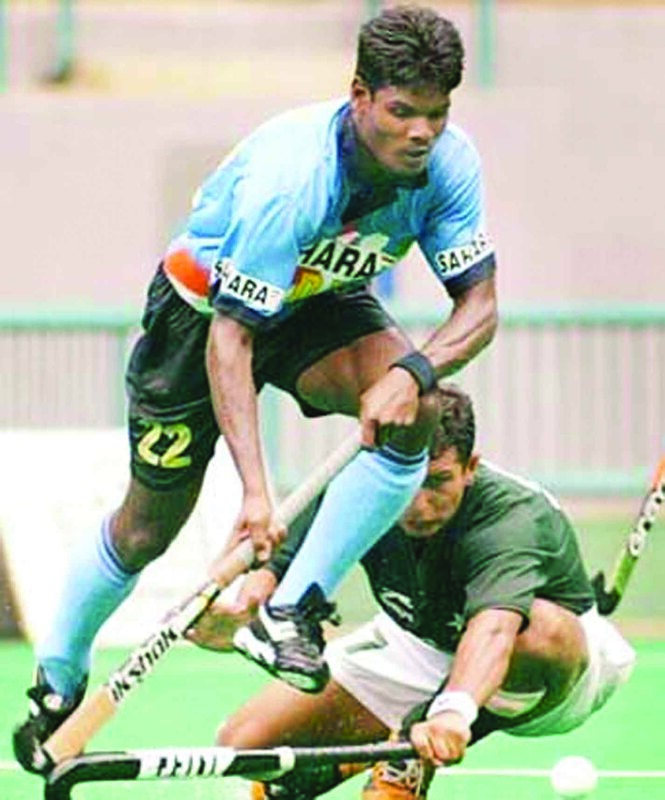 Tirkey, who was the captain of the national team in 2005-06, was also part of the squad that went to Athens Olympics in 2004. “By that time I was playing with senior players like Dhanraj Pillai, Dilip Tirkey and the likes. It was a pleasure playing with them,” says the Padmashri awardee. However, India’s winning streak has faded by then and Tirkey says lack of technology, tactics and communication was the reason for the poor performance. “But things have changed now as technology has come in that helps the team study their opponents’ tactics,” he says. The player was out of the game in 2010 for knee injury and made a comeback in 2011. He also played the London Olympics in 2012. He bowed out of international tournaments in 2012 and played the last match for army in 2017. Tirkey came to Shillong last April and as a veteran player and PTO, he has been tasked with finding young talents. “I thank our senior Brigadier Mukesh Gurung for the opportunity,” says the former player, whose contribution to the game was acknowledged through various awards, including Arjuna Award. It was at the national camp in 2002 that Tirkey met Surin, who is from Kolebira in Jharkhand. “I liked her instantly. I would watch her practise and she was really good. We went to Busan (Asian Games) together and I proposed her there,” he says with a shy smile. Surin too started playing hockey at a young age. She started her education in a missionary school in Simdega and later came to the hockey players’ hostel in Gumla. Later, she came to Bariyatu in Ranchi. All through these years, Surin continued her game. Surin played her first national tournament in 1999. She has also played in the Commonwealth Games, Asia Cup and Asian Games. “The women’s team won Commonwealth twice, in 2002 and 2006. The team was good,” she says. The team won gold in Manchester in 2002. Talking about the difficulties, Surin says sponsorship was a problem during her time. “The women’s team especially had difficulties. But now things have changed,” she adds. Surin led the team at the National Games 2002 in Hyderabad and scored three goals. While Surin is the only hockey player in her family, Tirkey’s younger brother Prabodh also plays hockey and was the captain of the national team. The hockey champions got married in 2008. Surin, who is an employee of Indian Railways, stays in Jharkhand with their six-year-old daughter Mansi. She quit playing after 2007 and got busy with her family. Now, the couple want their daughter to be in sports. “If not married I would have continued playing. Now I try to watch the tournaments. But juggling family and work is a difficult task. I don’t even get time to take my daughter to the field,” she says. Tirkey is certain about the “hockey genes” in his daughter but leaves it on the little one to decide for herself which sports she wants to choose.